Amazon Version of the video (without the bookstore link and with a slower progression of slides). Access video at Author Central for Charli Mills (amazon.com/author/charlimills ). Q: Is Charli your real name? A: Yes, it’s short for Annette. Ever since I was born, my parents called me Charli, something to do with a comedian skit from the 1960s about a baby called “Cryin’ Charli.” I didn’t know. When I was ten, someone asked me why my Dad called me Charli, and I said, “Because he wanted a boy.” Again, I didn’t know. My great-grandfather who was an Irish-Portuguese buckaroo bull-riding champion called me “Shorty,” but he called everyone Shorty, even his cow-dog. No one called me Annette until I gave myself a different, more sensible nickname of Nan. That’s how my husband’s family came to know me. Then my husband heard my family call me Charli and, well, when it’s your name and makes no sense you go with it. Q: Is there a real Carrot Ranch? A: If you are reading this response, then, yes — you are at the Ranch. Welcome! It’s a real place where real writers from around the world gather online. If you mean is it a brick and mortar place (or hayfields and barns), then no. It exists in my imagination as an amalgamation of the different ranches I experienced growing up and the Idaho bog pond where the idea for it came to fruition. The horse in the Carrot Ranch banner is real, but to protect her identity, we call her Scarlet. I once saved her after she got tangled in fencing. And she used to lick my dog as if he were her colt. Q: What is a “buckaroo”? A: Good question! A buckaroo comes from the Californios culture of Mexican land grant and mission ranchos. Before Sutter found gold in California, the Californios raised cattle and horses across vast swaths of coastal mountains and valleys where they also grew vineyards and orchards. My family came to California in the great gold rush of 1849 and pushed a herd of cattle all the way from Missouri. They were displaced Highland Scots with feisty dispositions and a refusal to give up their Catholic faith. Because the Californios were also Catholic, they fit right in with the existing ranching community and adopted its buckaroo culture. The difference between Texas cowboys and western buckaroos resides in the tack they use and how they train and ride their horses. To a cowboy, a horse is a tool; to a buckaroo, a horse is a partner. Q: Why are you lead buckaroo? A: We romanticize the American West worldwide, and yet many of its idealized attributes are values firmly rooted in buckaroo culture. We idealize our own relationship with horses, and Carrot Ranch was a way for me to give a nod to that buckaroo heart that still beats in my chest when I see a horse. It’s also a persona that I adopted in my career, especially as a marketing manager — I taught branding to other organizations and often used the buckaroo brand for myself. “Creator” or “owner” sound like pretentious titles to me, so I wanted a moniker that was authentic to who I am and yet fun and approachable, too. Lead buckaroo gets more notice than CEO. Besides, buckaroos are willing to get boots mucky when they lead, unlike many CEOs who prefer to stay clean. Literary art is dirty work. You can’t lead unless you get in the muck, too. 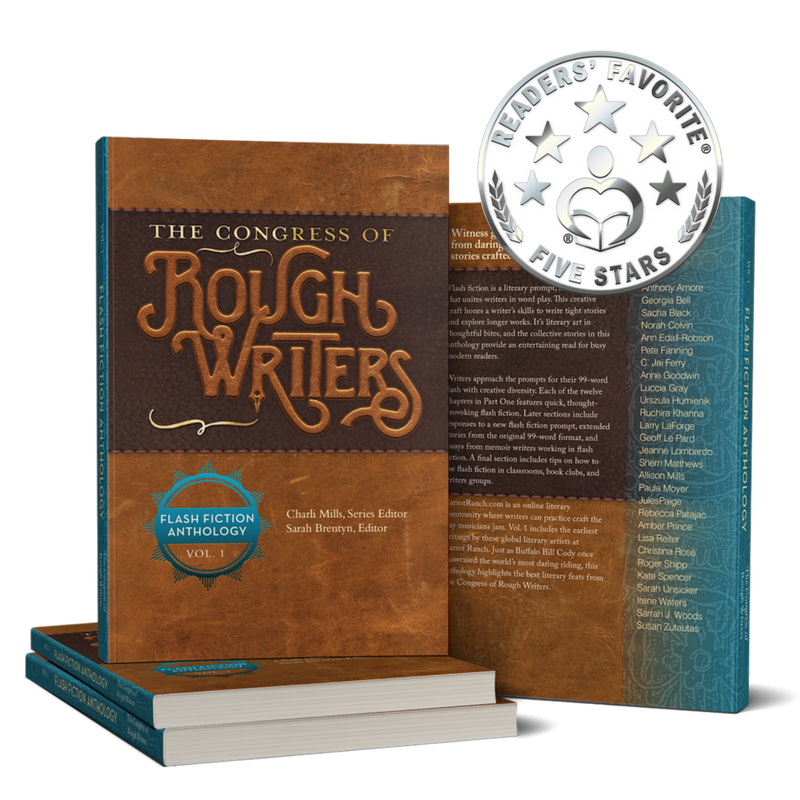 Q: Who is The Congress of Rough Writers? A: The Congress of Rough Writers are the writers who support, participate or write at Carrot Ranch. In our early development as a literary community, these were the writers who gathered to write flash fiction each week. In our book’s dedication I wrote, “First we were strangers, and then we wrote together.” To actively become a community takes trust and engagement. I’m certain it was like that for Buffalo Bill Cody when he’d travel with his Wild West Show. He called the entertainers The Congress of Rough Riders. And while you might assume all the wild west rough riders were from the American frontier, that’s not true. Cody amassed riders with spectacular horsemanship from around the world. His Wild West Show was international. It seemed to be an appropriate name for our group at Carrot Ranch given that we come from the US, Canada, the UK, Australia, Poland and Spain. We have more countries and more new writers to add. Diversity is what makes us strong and compelling in our flash fiction art. A: Because of its brevity, flash fiction doesn’t demand much time away from our individual writing projects and goals. It’s like writers sharing a quick cuppa. During a tough week, it can be refreshing to have a quick write with friends. Also because of the constraint (99 words, no more, no less), flash fiction imprints its form as a problem-solving tool. When I’m stuck in a scene from my WIP (work in progress), I write a 99-word flash fiction to better understand the heart of that scene. If I have a gap, I write a flash fiction and see if it sticks. If not, I write another. If I’m working with a business client, I take their material and write a flash to get a fresh angle. Flash fiction is both a powerful storytelling form and a remarkable writing tool. Q: Who is the intended audience for flash fiction? A: Anyone who likes to read stories but doesn’t have the time. In a collection, flash fiction is like a bowl of potato chips — you can’t read just one. It’s snack-sized literature. Each chapter in Vol. 1 is about 10 minutes of reading time, perfect for a lunch break or hanging out on a commute. The book has greater depth and is also intended to engage book clubs and writers groups. Each flash fiction chapter invites anyone to respond to the prompt on their own. It can be a great exercise for readers who want to better understand the writing process. And as I already said, flash fiction is a practical writing tool. We dedicate a section to encouraging others to create communities using our flash fiction model. Q: Who is the publisher? A: We have our own imprint, Carrot Ranch Literary Community, and we publish independently. We print and distribute globally through Book Baby. They also designed the interior of our book, formatted all the pages, and set up global distribution channels, which is known as wide marketing in the book industry. Because our community is global, we wanted the book to be available in international markets. We also published independently to learn the ropes. It doesn’t matter how many authors you talk to until you publish on your own, you don’t really understand the magnitude of work involved. It’s worth it, though, to bring worthy literary art to a wider audience.